Simple piston 1st stage, a "work mule" that is affordable, simple, reliable and robust, suitable for intense use. This first stage is appreciated by dive centers and professional companies who consider it to be a very rentable tool, due to its low cost and practically nonexistent need for maintenance, as well as a surprising level of performance. Conical filter with large filtering capacity, essential for preventing infiltration of particles from the tanks. This feature is especially important for regulators in dive schools and rental agencies. Air flow administered at 2100 l/min with an intermediate pressure drop in intensive breathing (150 bar) 0.5-0.8 bar (Measurement taken at an LP port with the second stage connected and 150 bar pressure in the tank). Exterior LP regulation via Allen key, greatly facilitates managing adjustments and technical maintenance. One 7/16” high pressure port (HP) and four 3/8” low pressure ports (LP). New ultra simplified monocoque second stage in ABS + elastomer, small (6 cm in diameter), very light (145 g) and robust, designed and built to have a minimum number of components. It is a smart buy due to its combination of performance, reliability, price and cost of maintenance. It is perfect for uses requiring maximum reliability and is an ideal travel regulator, given its lightness together with the the 1st stage MC5. 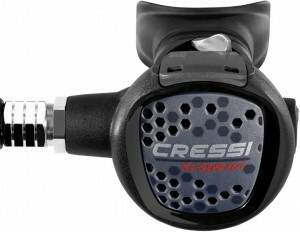 It is also perfect for dive centers, as a work regulator with AC2, and as an addition to the high range MC9. The specific calibration of the inhalation mechanism slightly changes the air delivery as compared to the Ellipse series; the feel and sensitivity of these models is exquisite, with an abundant flow without needing to exploit the Venturi effect. His feature adds a scant tendency to freeflow on the surface and when positioning the equipment in the water, ideal for schools and rentals, octopus and double regulator. Nevertheless, the performance results put it at the top of the highest range of regulators. Asymmetrical perforation in the front cap. The flow of the water starts to push the diaphragm counter-clockwise so that its retraction is perfectly flat and the cam progressively descends perpendicularly, independent of conditions (currents, brisk movements, facial position, etc.). Exhalation effort particularly reduced without having to reduce the thickness of the diaphragm. The design of the membrane retention system directs the 100% channeled flow towards the nozzles of the bow, taking advantage of a strong Venturi effect. Also, it works to direct the bubbles away from the diver’s field of vision. Embedded membrane to avoid water infiltration in case of brisk turns or jumps to enter the water. Practically integrated purge button, between 80-400% larger than that of any other regulator on the market to facilitate purging, especially for beginning divers. Cap system assembly by a 30º bayonet turn, assuring very safe and simple assembly-disassembly, also while cleaning out sand on the beach, without the need of tools. Reduced ageing due to usage thanks to the casing finish, achieved by applying a new technology in the mold that creates a variegated look on a micro-texture of rounded profiles. Click the button below to add the Cressi Sub AC2/Compact Regulator to your wish list.